Featuring a pair of centermen who shared time on the Pittsburgh Penguins bench in the early-1990s, we have game-used sticks from both Mike Stapleton and HOFer Ron Francis. A Louisville TPS model, the Francis stick has his name visible but faint over the upper shaft, with the original tape over the blade and knob – with handwritten “10”. There is also some factory coding along the underside, with the 1995 Lady Byng and Frank J. Selke Trophy-winner signing in black marker over the heel, with no issues for the signature. A hologram numbered “03199” has been placed over the lower shaft, with just light use exhibited on the lumber, with a few marks to the shaft. 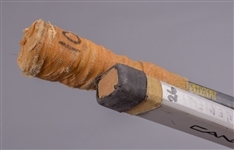 The Stapleton stick is a Canadien with “26” handwritten, and is actually a Joey Mullen model with “Mullen” stamped-on, with this type of model used by Stapleton while with the Pens, wearing the #26 jersey in 1992-93 and 1993-94. 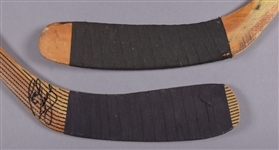 The original tape is in place over the blade and knob, with a tiny crack near the heel section. Moderate use is exhibited with marks over the upper and lower shaft, along with both red and blue paint transfer. Clear tape has also been added to the lower shaft, along with a hologram numbered “03200”.